A copy of the full master energy report is made available. The final plan included more detailed information about demand side management and energy efficiency programs which potentially could reduce expensive peak power purchases and having available on demand capacity. A major report on future options for energy generation and options recommends closing the the city-owned Blue Valley power plant and replacing the lost capacity through other options such as an increase ownership interest in the Dogwood natural gas plant in Pleasant Hill. The much anticipated detailed report looked at several different options with the overall goal of helping Independence Power and Light "supply an affordable, reliable, and environmentally friendly supply of capacity and energy for the next 20 years." The report is exactly that - only a report. The City Council has struggled making policy decisions after receiving extensive detailed reports from outside consultants, even when the analysis provided clearly policy recommendations. Examples include rate recommendations (2015) and advanced metering (2017). The City Council, at the Aug. 27th (2018) study session directed the City Manager to produce a Request for Proposal for alternative generating capacity that would allow for the closure of Blue Valley. The master energy report has significant bearing on a myriad of IPL issues, not the least being a cost of service study which is currently underway. Both the master energy plan and the cost of service study are being done by Burns and McDonnell. Cost of the master energy study is $325,000. A well-attended public hearing was held by the Public Utilities Advisory Board on Sept. 6, 2018. The Sierra Club and Renew Missouri submitted formal letters - both requesting the plan be more detailed on demand side energy efficiency efforts which could reduce peak power requirements. A third letter from Able Grid was also submitted offering commentary on the option of energy storage to provide incremental flexible capacity. The master energy plan tried to identify low-cost, reliable and safe energy which is environmentally compliant. IPL participates in the Southwest Power Pool which requires IPL to have 12% capacity over and above its established system peak load. 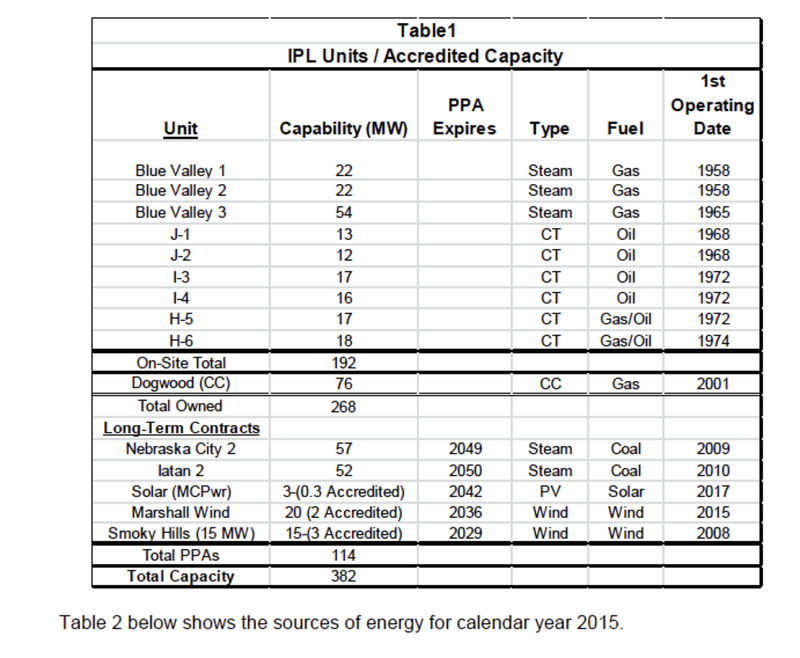 Some of IPL's new capacity - wind and solar - are discounted because of the intermittent nature due to the availability of wind and sun. Coal and natural gas get credited at 100% of generating capacity while wind is credited at 5% and solar at 10%. Blue Valley is recommended for closure because it is old, inefficient and historically been overstaffed compared to similar power plants. And it only generated less than 2% of IPL's overall energy needs in 2016. The future for displaced staff is complicated by current labor agreements though many IPL employees are nearing retirement age. Other half the current workforce is eligible for full retirement or early retirement at age 55 as of June 30, 2019, according to a staff analysis recently provided to the Public Utilities Advisory Board. The master energy plan explored 13 different scenarios on how best to replace generating capacity that would be lost if Blue Valley was retired. The options considered capital costs, fuel source, transmission costs, reliability and other considerations. The most economical recommendation (Path 5) involves retiring Blue Valley, operating current combustion turbines and purchasing 50 MW from Dogwood - a natural gas plant in Pleasant Hill where IPL currently purchases power. The prior master energy plan, done in 2011 also recommended purchasing more power from Dogwood but nothing came of that. A public hearing on the plan has been scheduled by the Public Utilities Advisory Board for Thrs., Sept. 6th at 6 pm at the Utilities Center located at 17221 E. 23rd St., Independence, MO. Indy Energy is helping promote the public participation meeting.